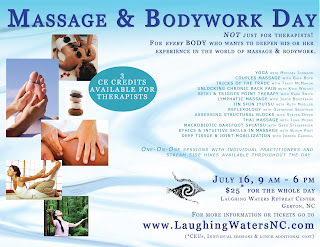 We’re providing another unique day to share the beautiful gift of touch, nature and community at the Day of Massage & Bodywork on July 16 from 9:00 am to 6:00 pm. It’s NOT just for massage therapists! Everyone is welcome to explore the world of massage. Whether you are a massage therapist or just interested in learning some techniques for yourself and friends, this day brings together teachers of many styles to explore over a dozen interesting modalities. It is open to everyone, and 3 CE credits are available to interested therapists. Stream side hiking and one-on-one sessions are available throughout the day. COST: We’re making it super affordable. $25 for all day, $30 at the door. A healthy lunch will be available for purchase. CE class Exploring your Intuitive Abilities is an additional $40. Approved Provider Number 451613-11. To purchase tickets go to Brown Paper Tickets. We’re providing another unique day to share the beautiful gift of touch, nature and community at the Day of Massage & Bodywork on July 16 from 9:00 am to 6:00 pm. to everyone, and 3 CE credits are available to interested therapists. We hope to see you on July 16th for a really great day of nurturing touch and play in the mountains. And remember to tell your friends! You’ll want someone to trade body work with later!